If you’ve ever owned a motorbike, do you recall the excitement of when you first got it? What sort of bike was it? I remember mine. It was an Enfield. Retirement has a lot to offer. Think about reliving your misspent youth or the dreams you had before everything else came first. It was retirement that got me thinking about my first motorcycle. It had been some 35 since I last owned anything that had a motor balanced on two wheels, making it just as long since I had ridden. Just before my 67th birthday came the opportunity to buy a 2017 Royal Enfield 350 Classic. They are single-cylinder engine, and it looks like a 1950s bike, but with modern brakes, ignition and electric start. My wife and one of my daughters arranged the purchase for me from my daughter’s partner. They arranged it as a surprise early birthday present. In no time at all I headed to Christchurch to pick up this magnificent beast. 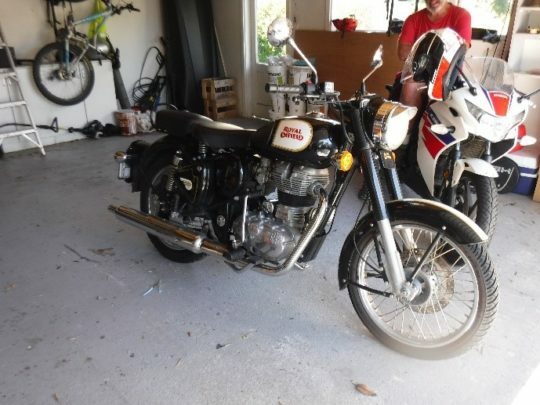 The bikes I had when I was young makes a 350 Enfield look big. My older sister had a Rabbit scooter, which of course was the first ‘motor bike’ I rode; I was probably around 14 years old. My next older sister bought a Vespa, which I bought from her when I was 15 as I needed something to get 25 miles (40 kilomentres) to and from work on an income of $15 a week. It drove at 40 miles and hour (65km/h) was about as good as I could ever get out of it on the flat. I did a lot of miles commuting every day, summer and winter, Riverton to Invercargill. I had a Honda 50, which I picked up in boxes, rebuilt it, then later sold it to my younger sisterand then my last bike was more powerful in the form of a Honda 90. That was back in 1976 when I was living in the Bay of Islands on the North Island of NZ. Getting married, having children and everything in between meant the bike riding was put on hold, but as I enter full-time retirement my 2017 Royal Enfield with 5,000km on the clock was a welcome reality. 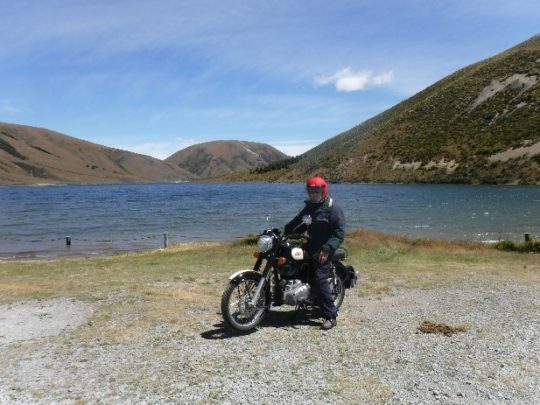 The delivery ride was 250km Christchurch to Greymouth over two Alpine passes of some 940m and 920m each. When I arrived back home, my grandchildren were keen for a ride. One at a time I took them on a short ride on my new bike. I noticed that they struggled to reach the foot rests comfortably and decided I could make a minor modification to fix that. With a little scrap alloy in my shed, four holes and four bolts later the foot rests are about 100mm higher, making it easier, safer and legally compliant for the kids. One a ride with my six-year-old granddaughter she asked me, “Granddad, do you have a special licence to ride a motorbike?” I confirmed that I did. “Grandad, do you have a licence to carry kids?” she asked. I was somewhat taken aback by her concern for my legal compliance. The internet has changed the way I can get together with people who have similar interests. 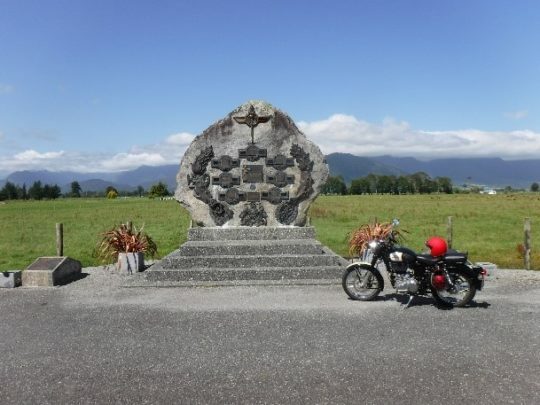 There is a Royal Enfield owners’ group in New Zealand and when I looked them up I discovered they were about to have their annual ride to a small town just north of Greymouth called Reefton. Reefton is known as the Town of Light because it was the first town in the Southern Hemisphere to have electric public street lighting, and has a lot of historic charm. Until recently it was a busy coal and gold mining town in New Zealand. Unfortunately, the day of the ride coincided with my wife’s 65th birthday. I wasn’t sure I was brave enough to ask if I could be absent on her special day, especially as all our children, their partners and our grandchildren would be there. The thing one learns after a significant time being married, you might say… Yet, when I told her about the ride she said, “You can go if you like, just be sure you’re back in time for dinner”. I registered without too much heistation. My eight-year-old grandson was very enthusiastic about it when I mentioned it to him and he wanted to join me on the ride. The trip was 80km each way, and there was a 9km detour to the ghost town of Waiuta (it was once a bustling mining town) with a stop for lunch at the Ikamatua Hotel at Ikamatua. 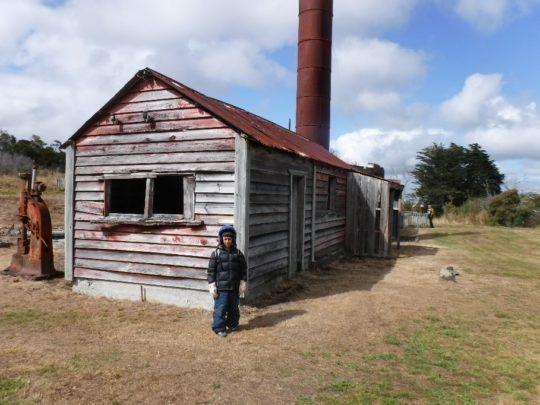 The Blackwater School at Waiuta is one of the few buildings still standing. My grandson took great delight in exploring the cupboards of the abandoned building. “Granddad, where did they hide the tails?” he asked. 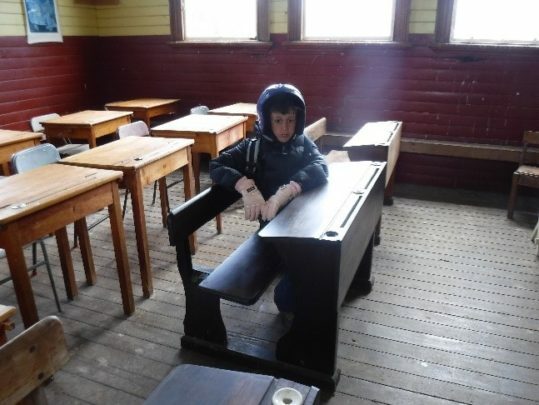 He was looking for a strap, which in my day as a student was all part of corporal punishment handed out for even the most minor of misdemeanors. Remember ink wells and blotting paper? Finally, we took the route from Hokitika to the Hokitika Gorge, where one of the largest manhunts in New Zealand took place. Stanley Graham was a New Zealand dairy farmer who murdered seven people in Kōwhitirangi in 1941. Policemen had gone to Graham’s farm after a neighbour had told them the farmer had threatened them with a rifle. Three of the four policemen were shot dead, while the fourth policemen died later from the wounds he sustained. Graham fled into bushland and was pursued. He managed to elude being captured for almost two weeks before he was found and killed by police. 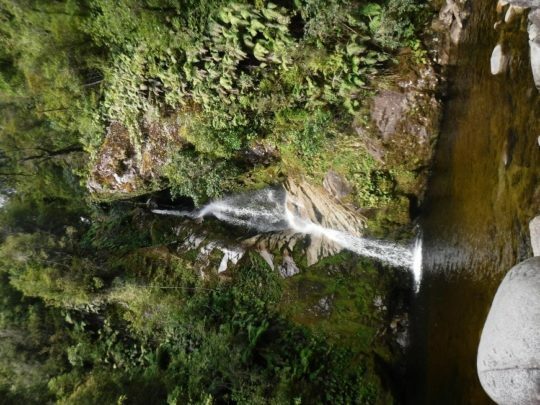 From the Hokitika Gorge we travelled to Kōwhitirangi thne around Lake Kanierie to take in the view of Dorothy Falls, and then we returned home. It was a great way to run the bike in, but it also gave me an opportunity to explore the local area with my family. I look foward to more adventures like this. Oh, and I definitely got back in time for dinner! Do you enjoy riding motorbikes? Have you considered travel on the back of a bike?